In this day and age of environmental concerns, local bus service is truly an energy-efficient mode of transportation. To increase bus ridership, it is important to make buses' interior environment convenient and comfortable. 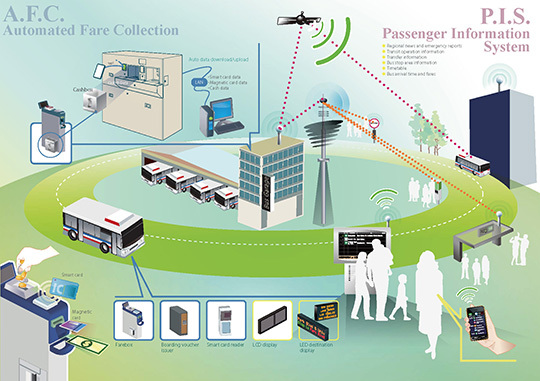 LECIP develops easy-to-use onboard systems, encapsulating a wealth of information processing know-how in a single bus, with products ranging from fare collection systems to fare displays, destination display units, digital voice announcement systems, and deboarding-in-progress signs. Digital fare displays, LCD displays, LED destination displays, etc. LECIP is a pioneer in the automotive lighting market, having developed Japan' s first fluorescent lamps for trucks and passenger vehicles. LECIP commands the top share of Japan' s domestic market for fluorescent lighting for commercial vehicles. LECIP' s automotive lighting products, including lights for truck cabins and cargo compartments, have been adopted as genuine parts by truck makers. LECIP also supplies the Shinkansen (Japanese bullet trains) with lighting fixtures renowned for their high quality. LECIP is developing automotive lighting that uses LEDs as a light source. LECIP supplies high-value-added automotive lighting products designed for both functionality and environmental friendliness. LECIP supplies a wide range of rechargers and power supplies that incorporate DC control and high-voltage technologies based on electric power conversion, one of LECIP's core business domains. LECIP is developing finely differentiated products tailored to specific applications, including emergency uninterruptible power supplies that prevent sudden power outages (e.g., due to lightning) from wreaking havoc. LECIP offers a broad line of lighting products, ranging from various models of power supplies and transformers, most notably including inverter-type neon transformers, electronic ballasts for exterior fluorescent signs, and DC power supplies for LED signs. Uninterruptible power supply, recharger for battery-driven forklifts, unified reader terminal for e-money and credit cards, LED power supplies, fluorescent LED lamps, Neon transformer etc.